Acupressure is an ancient technique to relieve pain, and cure the body from different kinds of ailments. The science behind this practice is a well-studied one about how different points on the hands heal the corresponding infirmity in the body.Supporters and practitioners of this medical science believe that once a person starts observing acupressure as a regular practice, the body develops an ability of its own to heal itself. With time it has also been confirmed that through this technique positive changes like increase in immunity, release of tension and improved blood circulation take place. It’s extremely important to recognize which area in the body is being subjected to pain or stress. Once that has been determined, the next step is to look for the corresponding point on the palm. The point is slowly pressed for 5 seconds, gradually increasing the pressure. After this, the pressure is released for 3 seconds. The cycle of 5 seconds of pressure and 3 seconds of relief is repeated for a couple of minutes. While this technique is suggested in case of regular pain, in case of chronic pain it’s advisable that everyday you put pressure on the corresponding point using your thumb to massage. In this manner you’ll be relieved of your discomfort sooner than expected. 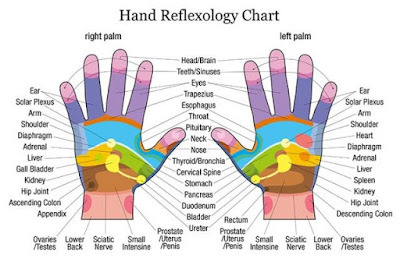 The best way to know which point corresponds to which section of the body is by following charts that depict pressure points on the palm. It’s an easily accessible chart and one can follow it to know about different ways to relieve oneself from pain. For example, in case of a headache, the inner side and upper section of the thumb can be pressed to release the pain. This is because the tip of the thumb, the index finger and the middle finger, is directly linked to the brain. Consequently, pressing the tip of the thumb gradually eases the stress that you may be experiencing in your cerebral nerves. Similarly, in case of sinus, or sinus related infections, applying pressure on the tip of the index finger may help you feel relieved. And in case of muscle tension in the shoulders, using pressure points on your pinky finger may help in reducing the stress. One must keep in mind that the pressure points towards the left or the right side of the hand correspond to the same side (i.e., left or the right, respectively) of the body. If you remember this little detail then it’ll be easy for you to also locate different pressure points on the hands. Thus if you feel more pain on the right side of your head then you may begin with pressing the thumb of the same side’s hand to ease yourself from pain. Like mentioned earlier, there are certain health conditions that acupressure can help relieve the person from. One of these is increased blood pressure in the body. In such a situation choose a point on the first line of the left hand’s middle finger, and start applying pressure on it. Gradually this will help in controlling the increasing blood pressure. Whereas you can cure yourself of dropping blood pressure by applying acupressure on the opposite side on the mentioned part of your hand.